The XB-51 was a one-of-a-kind movie star that starred in the 1956 movie entitled Toward the Unknown as the Gilbert XF-120, which would have made it the world’s biggest fighter! What began life as a four-engine turbopropjet (two) and turbojet (two)-powered attack aircraft designated XA-45, evolved into a three-engine, turbojet-powered, medium-class bombardment aircraft designated XB-51 under U.S. Air Force Air Materiel Command Project MX-838. With Martin chief test pilot O. Edwin “Pat” Tibbs at the controls, the premier XB-51 made a successful first flight from Middle River, Maryland, on October 28, 1949. Nineteen days later on November 15, 1949, USAF contract number AC-14806 was approved for the two experimental XB-51 airplanes — USAF serial numbers 46-685 and 46-686. 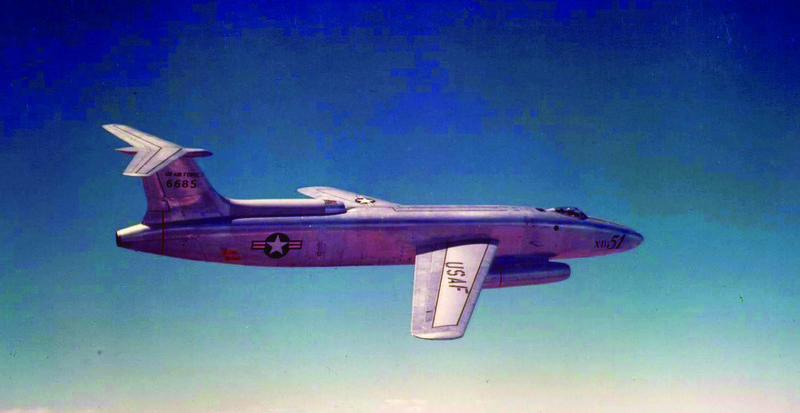 The second XB-51 made its first flight April 17, 1950. Both examples were soon ferried cross country to Edwards Air Force Base in California. The experimental XB-51 medium-class, low-level attack bomber was unique in that it was powered by an uneven number of three turbojet engines, whereas all other jet bombers came with even numbered sets of two, four, six, or eight turbojet engines. Its three engines were non-afterburning 5,200-pound thrust axial-flow General Electric J47-GE-13 turbojet engines that gave the XB-51 a level attitude top speed of more than 600 miles per hour at sea level. The specifics are identical for both XB-51s. They measured 85 feet, 1 inch in length and 17 feet, 4 inches in height, with a wingspan of 53 feet, 1 inch. Their maximum speed and altitude was 645mph and 40,500 feet, and they cruised at 532mph; maximum range was 1,600 miles. Their operational armament was to consist of eight nose-mounted, 20-millimeter cannon and they were to carry either 10,400 pounds of bombs or eight five-inch, high-velocity aerial rockets (HVAR) internally on a rotary launcher. Like the Boeing B-47 Stratojet and Martin XB-48, the XB-51 featured a bicycle-type landing gear arrangement with outrigger wheels/tires for taxiing balance on the ground. Their gross takeoff weight was 55,930 pounds. Production B-51s would have a two-man crew of pilot and bombardier/navigator. Both wing and horizontal tail plane featured variable incidence. All flying surfaces were swept back to alleviate compressibility and to increase its speed.